The rugged, effective, state-of-the-art Bonfiglioli F Series of shaft mounted gearmotors is lightweight and easy to install. With dependable performance, it is perfectly suited for all material handling applications. ECD offers a comprehensive range of automation, control and mechatronics products. 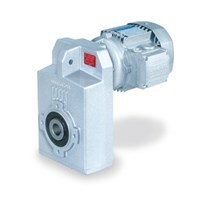 Call ECD today, for more information on Bonfiglioli F Series gearmotors and all your gearmotor needs.